How to get the holiday hair look? • A coconut oil-infused gel to instantly achieve hydrated, lived-in, undone hair. • Inspired by the international jet set, Rich Kid’s moisturising properties give you the hair you’ve always wanted. Reap the nourishing benefits of coconut oil in a weightless formula that moisturises and conditions, leaving hair with a natural luster and softness. Ideal for fine to normal hair, it replenishes lost nutrients that could cause hair to be weak, dry, or damaged. • This product is vegan, cruelty-free, and free of gluten. I recently was given this amazing product by one of my besties on a recent trip to Malibu! So thanks Meggie ;-). As I am a beauty/ haircare junkie, I had to share with all my fellow females how fab this stuff! If you love that effortless, tasseled, undone, beachy kind of look, than this is your match made in heaven! The texture is rich and creamy and leaves your hair smelling like a holiday… aka beach in a bottle! 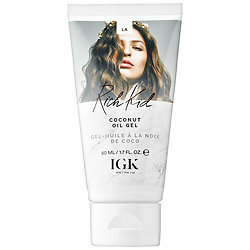 To really maximise the benefits, I love applying a generous amount of organic coconut oil to my hair before bed, leaving it in all night, than washing and conditioning in the morning, Next I will add a big coin size of the IGK coconut hair gel to towel dried hair, blast it upside down for a few minutes with the blow dyer than styling it into a loose braid for a few hours while it properly drys! The results…. beautiful, bouncy, beachy, hair!